The name ‘Good & Green’ came from the dream we have been dreaming for a long time-that to make the long desired intersection between quality living & social good. 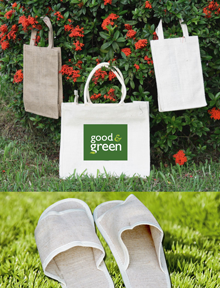 It was that dream to produce product eco-ethically we adopted the name ‘Good & Green’. We do maintain a strong monitoring system to ensure that all our products are produced in a ethical set-up and all our production and maintenance process ensure a Eco-friendly method. We’ve our our own production facilities. Besides, we’ve a community of artisans & SMEs across country who makes products for us. We train artisans, launch health education program for them and we also support them financially in need. Jute is a highly versatile and substantially eco-friendly item. It is a great alternative to the common “one trip” plastic carrier bags that pollute our landfills in their billions and take hundreds of years to degrade. By comparison, Jute bags are strong, sturdy and enable re-use many times over. 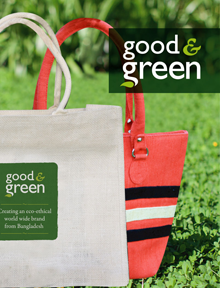 We urge you to switch to Eco-ethical bags/products for a sustainable future. All the products we produce are eco-friendly and does not cause any harm to our mother earth. Besides, we maintain ethical setup, and process in all our production, maintenance, and design and other activities so that we remain ethical. Sustainable packaging is the development and use of packaging which results in improved sustainability. At the end stage of design it involves increased use of life cycle inventory (LCI) and life cycle assessment (LCA)to help guide the use of packaging which reduces the environmental impact and ecological footprint, but in the very first steps requires a look at the whole of the supply chain: from basic function, to marketing, and then through to end of life (LCA) and rebirth.The goals are to improve the long term viability and quality of life for humans and the longevity of natural ecosystems. Sustainable packaging must meet the functional and economic needs of the present without compromising the ability of future generations to meet their own needs.Sustainability is not necessarily an end state but is a continuing process of improvement. (Source: Wikipedia). Worldwide consumption of paper has risen by 400% in the past 40 years, with 35% of harvested trees being used for paper manufacture. Logging of old growth forests accounts for less than 10% of wood pulp, but is one of the most controversial issues. Plantation forest, from where the majority of wood for pulping is obtained, is generally a mono-culture and this raises concerns over the ecological effects of the practice. In simple jute fabric is the cloth made out of jute fibre-the second most important vegetable fibre after cotton. Jute is used for manufacturing a number of fabrics i.e. Fine Jute Fabric, Hessian cloth, sacking, carpet backing cloth (CBC), and canvas etc. FJF, Hessian, is used for bags, wrappers, wall-coverings, upholstery, and home furnishings. Jute packaging is used as an eco-friendly substitute. Jute fibre is 100% bio-degradable and recyclable and thus environmentally friendly. Moreover, one acre jute plant consumes up to 15 tons of carbon dioxide and releases 11 tons of oxygen. We use Azo-free vegetable dye in manufacturing & coloring jute bags. We use bio-degradable food grade lamination in our jute bags. However, we encourage avoiding lamination for too reason-it keeps bag more natural and it inspires minimalism. There are various types of jute fabrics that are used in making jute bags i.e. Fine Jute Fabric (FJF), Hessian, Carpet Backing Cloth (CBC), and canvas. So far, best quality bags are prepared from FJF fabrics. The quality depends on price. However, we try to make our bag from best quality FJF fabric. Yes. We are here to make your wish happen. Let us know what kind of text, color, design you want, and get ready to be surprised. We give you the total authority to design your own bag. An ‘Ai’ that is adobe illustrator format is best for printing purpose. It gives flexibility to size and re-size without compromising quality. We appreciate you to order minimum 5000 piece at a time. It keeps the cost in balance. In printing all colors except black and white are multi-color, say for example: red is a four color combination. So there is no extra charge because there is not multi color. Usually we take a week to manufacture about 5000 bags. We are here for making good for planet, people, and society. We pay handsomely to our artisans and workers, we ensure safe and standard working environment for our worker, we offer training for our artisans and workers, and we do provide free education for kids of our workers. And we’re on a mission to ensure ethical practice in business.